Llorens Leaded Art Glass, Inc. is a third generation family owned and operated business. The Llorens name is synonymous with leaded glass “know how” and has been for over 95 years. Our Company was founded by Frank D. Llorens, Sr. Frank’s father, Joseph V Llorens Sr., was a true artist in every sense of the word and taught Frank Sr. every facet of the business because stained glass is and always has been a Llorens passion. He is adamant about quality and knows the best way to accomplish any project. Frank D. Llorens, Jr., is a very important part of our business. He brings technology to the table and learned from Frank Sr. all aspects of the stained glass business. Frank Jr. is a graduate of Georgia State University in Business. Charlene Llorens, wife of Frank Sr., is in charge of the office. Charlene has a BFA in Fine Arts from the University of Georgia. Working with color coordination is her claim to fame. David Adams is our artist and a graduate of Georgia State University with a degree in Art. David worked with Joseph V Llorens Sr. and was trained by him to paint on glass. We design, build, and install stained glass windows and leaded art glass windows for churches, businesses, and residential home owners. 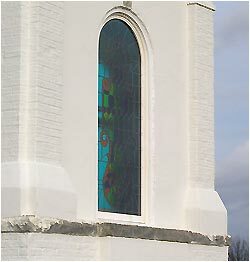 Stained glass church windows are our specialty. We use technology to our advantage to produce precision glass designs in a timely and economical manner. We are located in Winder, next to the Barrow County Airport, 50 miles northeast of Atlanta, Georgia. This location allows us to serve our local Atlanta customers and our southeastern regional customers. Contact us today! We look forward to earning your business. Llorens Leaded Art Glass, Inc.
copyright © 2009- Llorens Leaded Art Glass, Inc.